Canada is now witnessing the “corporatization” of its universities and colleges following decades of massive government cuts to funding. According to a new report from the Canadian Union of Public Employees, public funding for Canada’s post-secondary education system has fallen dramatically over the last three decades, with costs shifting onto students through higher tuition as corporate partnerships compromise the integrity of academic research. 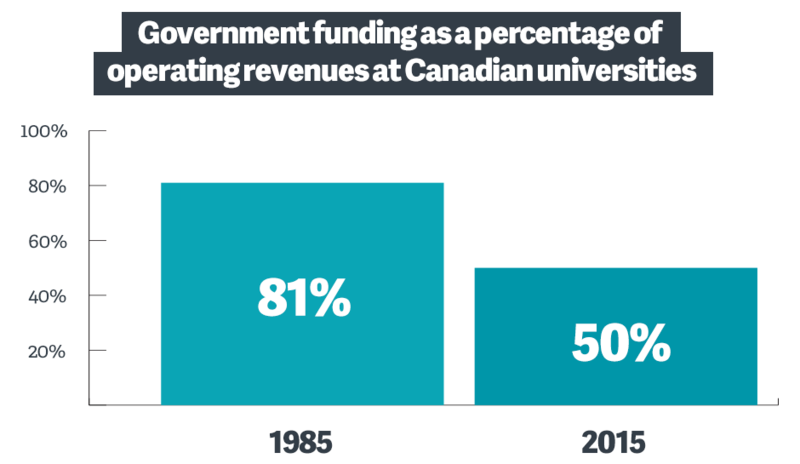 In 1985, public funding accounted for 81% of operating revenue at universities in Canada. Three decades later, public funding fell to 50% of operating revenues in 2015. 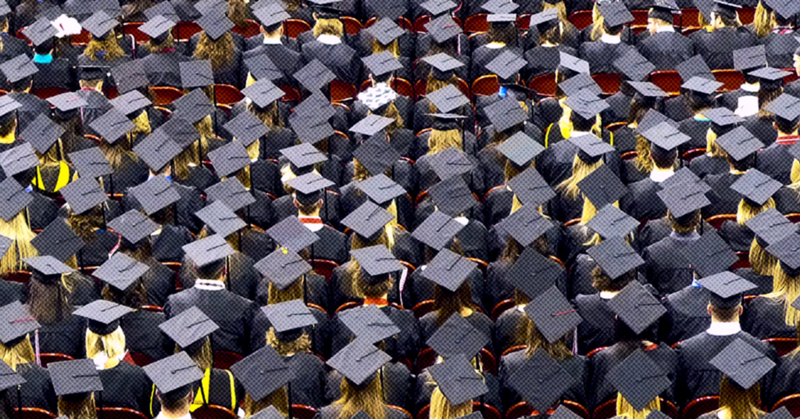 As a result, Canadian post-secondary institutions are increasingly dependent on the “generosity” of “wealthy individuals and corporations” to cover costs. In 1985, only 2.7% of university operating revenue came from neither public money nor user fees, but by 2015, that had more than quadrupled to nearly 10%. The report notes together donations, grants and investments accounted for 34.6% of funding for sponsored research. The report notes money is often given with strings attached – and, those conditions mostly involve changes in university operations. In one memorable controversy, York University was widely criticized after striking a $60 million deal with an independent non-partisan think tank founded and chaired by then-RIM Chairman and co-CEO Jim Balsillie to establish a school of international law. As the Financial Post noted, the University’s controversial original agreement gave CIGI a “voice to influence and veto, staffing and curriculum at the school.” York University later cancelled the deal. CUPE’s report points to Nancy Olivieri, a University of Toronto and Sick Kids Hospital researcher, who flagged concerns about adverse side effects of a drug she was testing. “Often, these types of deals come with seats on the department’s steering committees, which give these corporations a great deal of influence over what is taught and researched in the departments,” Coty Zachariah, national chairperson of the Canadian Federation of Students told PressProgress. An analysis by PressProgress last year found corporate executives now make up 33.5% of board members at universities across Ontario. The CFS chairperson said corporate representation on university boards of governors affects what say students, staff and professors have on the highest decision-making body at the university. 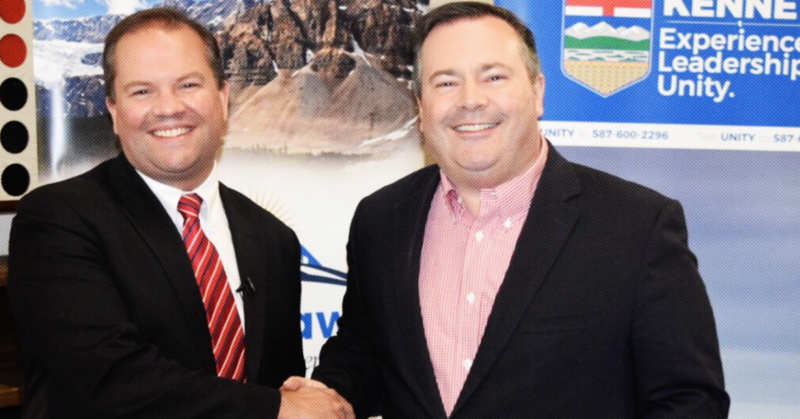 Corporatization also impacts the way boards operate, he says.